Two reporters with McClatchy Newspapers, Dorothy Korber and Carrie Peyton Dahlberg, collaborated on a story this week that gave two UC Davis nutrition experts the chance to share their no nonsense nutrition advice with readers. According to the story, nutrition professor Judith Stern said scientists don't yet know all the reasons for overweight, but suspect it is related to a person's biology, the environment and the interaction of the two. "When all the evidence is in, the (current) patients will be dead," Stern is quoted. Drink unsweetened tea, especially oolong, which has a long tradition of use for weight control in Japan. Before dinner, have a bowl of soup, not just broth but something with vegetables. If you're prone to mindless eating at a desk or elsewhere, keep healthy snacks around. Don't skip meals, particularly breakfast. Don't fool yourself about how much you're eating. Find ways to exercise during the day for a total of 60 to 90 minutes. Use a weight monitoring device that works for you: a scale, a notch on a belt or a skinny pair of jeans. On the way to and from the California Farm Conference in Visalia this week, I couldn't help but notice that many peach and almond orchards are coming into beautiful pink and white bloom. The fact hasn't gone unnoticed by the press. Last week reporter Heather Hacking of the Chico Enterprise contacted UCCE farm advisor Joe Connell for his take on the season. Many San Joaquin Valley counties have mapped out Blossom Trails, a great way to appreciate the presence of agriculture in the community. Speaking of community, even as farmers from around the state were meeting in Visalia to map out strategies for boosting the small-scale ag industry, the Lompoc Record included a story about the new Central Coast Grown Web site, which was created to encourage people to purchase food from local farmers. Reporter Steven Knudson included a long quote from UCCE San Luis Obispo farm advisor Mary Bianchi. “Our Cooperative Extension advisors and staff in San Luis Obispo County are looking forward to participating with Central Coast Grown in connecting our local community to the research-based information of the University of California that can help to support a thriving and viable San Luis Obispo agricultural community; one that has a diversity of profitable farms that enhance the environment, enrich our local culture and improve the quality of life for both producers and consumers of our local agricultural products,” Bianchi was quoted. 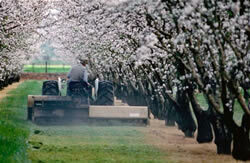 Over the next two days, the California Small Farm Conference is being held in Visalia. The Fresno Bee included a detailed roundup of the conference in last Friday's paper, giving high mention to Kaiser Permanente Medical Center, a sponsor of the event. The conference was established in 1982 by the UC Small Farm Program. The program is still involved, but the conference has taken on a life of its own. More than 400 small-scale farmers from around the state are expected to be on hand today for a presentation by "Dr. Broccoli" of Kaiser, plus numerous workshops and an awards banquet this evening. The Fresno Bee article notes that UCCE small farm advisor Manuel Jimenez will receive the first-ever Thomas Haller award. In addition, a media advisory written by Brenda Dawson of the Small Farm Program says the program's annual Pedro Ilic Awards will be presented this evening to Darren Schmall of Madera, known nationally as the "Pizza Farmer," for outstanding farmer, and to Santa Clara County UCCE farm advisor Aziz Baameur for outstanding educator. Huell Howser, producer and host of the PBS television program California's Gold, is the keynote speaker at the banquet. Media interest in the Haagen-Dazs gift of $100,000 to fund UC Davis honey bee research is incredibly strong. The story was picked up by 167 outlets, according to Google News. Kathy Keatley Garvey, a writer in the UC Davis Department of Entomology, said the Haagen-Dazs gift points to the value of media communications. The donation is the direct result of a release Garvey wrote about bee breeder Sue Cobey, which appeared on the UC ANR Web site. Ketchum Communications read the article, called Garvey and said a “client” was interested in donating funds. The client: Haagen-Dazs. A story distributed by UC Davis news service and posted on the ANR news Web site about a $100,000 gift from Haagen-Dazs to study colony collaspe disorder of honey bees was picked up widely by the news media. Associated Press reporter Julianna Barbassa included information about the gift and an effort by personal products maker Bert's Bees to raise awareness about the threat to honey bees in her story, which moved on the wire service early this morning. The Haagen-Dazs gift to UC Davis is aimed at averting a crisis for the ice cream maker, which uses a variety of berries, fruits and nuts in its products that depend on bees for pollination. 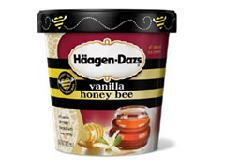 According to the AP article, Haagen-Dazs pours a million pounds of almonds alone into its products. 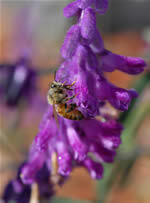 UC Davis is home to one of the oldest bee research facilities in the country, the Harry H. Laidlaw Jr. Honey Bee Research Facility. The Haagen-Dazs gift will aid research into sustainable pollination and colony collapse disorder, and will support a postdoctoral researcher.